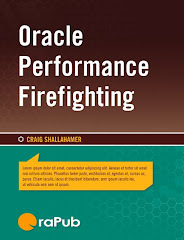 While going through and checking and updating my Oracle Performance Firefighting course for Oracle Database 12c, I once again compared session level CPU consumption from v$session and v$sess_time_model. In the past v$sesstat server process CPU consumption could be significantly less than what is shown in v$sess_time_model. Also, many background processes showed zero CPU consumption in v$sesstat while v$sess_time_model clearly showed CPU consumption. The lesson was to always use v$sess_time_model for CPU consumption. Though I have not tested this in 12c yet, in pre-12c releases this difference is very apparent when comparing values from v$sysstat and v$sys_time_model. To check this out for yourself, look at one of your Statspack or AWR reports. You will notice the Instance Statistic CPU used by this session usually to be shockingly less then the Time Model statistic DB CPU. If your Oracle performance analysis is highly quantitative driven (which I hope it is) you need accurate CPU consumption values. ... you should care. This also has been an issue for those developing performance tuning products! OraPub's Stori product (which helps you find, understand and solve Oracle performance problems) is based highly on quantitative analysis and therefore understanding the raw statistics reliability is extremely important. So Much To Write About 12c! I have so much to write about. There are a number of very interesting changes in the Oracle Database 12c release. If you have downloaded my recent NOUG presentation containing some of my initial 12c research, you'll know what I mean. What I presented was raw and not thoroughly tested...but I told you that. It will take me months before I get to the bottom of all of changes and post the results here, convert that into conference presentations and merge into my Oracle performance classes! Note: When you attend my Oracle Performance classes you will get the most recent results of my research. Even material that I have not brought to conclusion I will talk about... but I'll tell you my "confidence level" and why. Interesting, the 12c instance statistic "CPU used by this session" is statistic number 17 in 12c, yet it is 14 in 11g. NEVER hard code statistic numbers into your scripts!!! Using my free "opload" toolkit (which you can download HERE), I placed a number of different loads on my Oracle Database 12c (12.1.0.1) system. It's a 64 bit six core Linux (2.6.32-300.3.1.el6uek.x86_64) box. It is important to know when looking at the experimental results that I only recycled the instance before the first test. However, between each load change, I killed all the server/foreground processes. Why is this important? Because you may notice some of the background processes having a shockingly large percentage of CPU consumption... this is because they have been running much longer than the server processes. After killing the server processes and restarting a new and different load, I let the system stabilize for a minute and then waited (patiently) at least three minutes (usually 5+) before running the above script. A little background on what the statistics mean. Each statistic shown represents the CPU consumption since the session has connected. What is unique about the time model view is there is a statistic for both foreground/server processes and also for background processes. Since the time model view was introduced in 10g, I have always seen the values placed in the correct bucket. The raw CPU time model values are in microseconds. If you look at my script above, you may have noticed I divided the raw statistic value by 1000000 to convert its value into seconds. In contract, the v$sesstat values are in hundredths of a second, that is centi-seconds and therefore I divided by 100. In each of the loads below, I ran the above cpu_compare.sql script. In every situation, you can easily see there is a near perfect match...unless the CPU time is simply not reported! I ran a number of different loads; light buffer get, intense buffer get, free buffer wait load (physical reads, dml, small buffer cache), physical read (small buffer cache with some IO read related wait time), and an intense DML load to stress the redo mechanism. I figure if the CPU consumption results are consistent for all these workloads, the conclusions will be solid. The order I present the results below is the same order in which I changed the load and collected the data. It is good know because, after the first experiment, you can see the influence of the load on the background process CPU consumption change. The "load" sessions are the "sqlplus@sixcore (TNS..." sessions, but one of them is the reporting script being run. For example, for the first load (see directly below) there are three sessions. The first two shown are the load sessions and further the other is the session that runs the cpu_compare.sql script. I created a buffer cache large enough to cache all the data, started two Oracle sessions, the CPU utilization was around 5% with a CPU run queue between 0 and 2 (6 core box), and there was virtually no IO reported at the OS level (vmstat "wait for IO" statistic was 0). I created a buffer cache large enough to cache all the data, started four Oracle sessions, the CPU utilization was around 30% with a CPU run queue between 1 and 4 (6 core box), and there was virtually no IO reported at the OS level (vmstat "wait for IO" statistic was 0).. I created a buffer cache large enough to cache all the data, started twelve Oracle sessions, the CPU utilization was between 85% to 96% with a CPU run queue between 4 and 8 (6 core box), and there was virtually no IO reported at the OS level (vmstat "wait for IO" statistic was 0). I created a very small buffer cache to force lots of physical IO reads plus some DML activity, started six Oracle sessions, the CPU utilization was between 50% to 75% with a CPU run queue between 2 and 6 (6 core box), and the vmstat "wait for IO" statistic was between 4 and 15. I created a very small buffer cache to encourage physical IO reads plus significant DML activity, started three Oracle sessions, the CPU utilization was around 5% with a CPU run queue between 1 and 2 (6 core box), and the vmstat "wait for IO" statistic was between 15 and 20. There are a number of "take aways" from this experiment. Foreground/Server process CPU consumption values match for both v$sesstat and v$sess_time_model. This is not always the case in Oracle Database 10g and 11g. Foreground/Server and background process CPU consumption continue to be placed in their proper statistical bucket. Foreground/Server process CPU time into DB CPU and the background processes into background cpu time. This was the same in both Oracle Database 10g and 11g. Some background process's CPU consumption continues to NOT be reported in the instance statistic view v$sesstat. From my perspective this continues to be a bug. But we can deal with this from two perspectives. First, we have the time model view which looks to report correctly for all background processes. Second, background process CPU consumption is usually very small compared to foreground/server process CPU and if it is significant you can easily see this on an operating system monitor, like top. P.S. If you want me to respond to a comment or you have a question, please feel free to email me directly at craig@orapub .com. Another option is to send an email to OraPub's general email address, which is currently info@ orapub. com.